08:25 Hello and welcome back to AUTOSPORT Live as we continue our rolling coverage of the 2013 Indian Grand Prix. Sebastian Vettel topped a largely uneventful first practice session this morning, with team-mate Mark Webber backing him up in second fastest. Nico Rosberg challenged Vettel hard for top spot in the middle of the session, but had to settle for third with team-mate Lewis Hamilton fifth. Romain Grosjean continued his strong recent form by splitting the Mercedes' in fourth. McLaren's Jenson Button and Sergio Perez were next up, just ahead of Felipe Massa. Nico Hulkenberg and Valtteri Bottas impressed for Sauber and Williams by sneaking into the top 10. 08:26 We start the second session with the good (but unsurprising) news that there will be a race this weekend. A complaint had been lodged with race organisers for alleged non-payment of entertainment taxes for last year's race. The hearing for that has been delayed by the Supreme Court, so the 2013 Indian Grand Prix will go ahead without hindrance at least. 08:27 After the low-key opening session, normal service should resume here. Expect teams to go for early runs on the harder compound Pirelli tyres - which this weekend is the medium option. A switch to the soft tyres and low fuel loads will beckon around the middle of the session, and most are likely to go back to the business of fine-tuning the race set-up in the final half hour. 08:28 There is also good news for Fernando Alonso. Ferrari has confirmed the team has fixed a mechanical issue that sidelined him for much of first practice, but did not need to change his gearbox after all. 1 min: After a minute of silence, Chilton is underway in his Marussia. 1 min: Bottas leaves the pits on the medium tyre. 2 min: Raikkonen is one of the early runners in his Lotus. 2 min: Now di Resta is out, too, for the first time in the Force India after Calado took his place in the first session. 3 min: No reconnaissance lap this time around: Bottas is straight onto a second lap. 3 min: Both Toro Rossos are on track now. 4 min: We have our first time of the session, and it's a 1m29.663s from Bottas' Williams. 5 min: Chilton also wraps up his initial tour as the majority of the field now warm up to a flyer. 5 min: Raikkonen takes over at the top in 1m28.419s despite a sizable lock-up into the final corner. 5 min: The two Mercedes' join in the early session fun. 5 min: Ricciardo pops up into second on a 1m29.015s. 7 min: Alonso is on a flying effort with his car seemingly now sorted after this morning's gearbox strife. 7 min: Perez moves up to second fastest in the early order, with Button fourth in the other McLaren. 8 min: All bar Webber and Maldonado are on circuit. 8 min: Hamilton is pushing, and goes second on a 1m28.146s. 9 min: Grosjean takes over the leading time with a new best of 1m27.531s. 9 min: Vettel leaps to the top of the times soon after, though, with a 1m27.360s. 9 min: More Lotus action as Raikkonen has a gentle spin on his latest effort. Not a difficult one to recover from and he's back underway. 9 min: Meanwhile, Alonso is up to fourth fastest, with Massa fifth. 10 min: Ricciardo improves to a 1m28.021s, which puts the Toro Rosso driver third. 11 min: Raikkonen recovers from that off with a 1m27.889s to go third fastest. 11 min: Rosberg has gone off at Turn 15, but continued. He's 11th at present. 12 min: Grosjean moves to within a fraction of Vettel's best with a 1m27.365s lap, just five thousandths off the Red Bull. 12 min: It sounds like Vettel's having some KERS problems. He's told on the radio anyway, but hasn't listened and improves his best to 1m27.059s. 13 min: Webber jumps into second, 0.260s behind his team-mate, and it's now a Red Bull one-two. 13 min: Vettel now gets told they think they can fix the KERS problem. At the moment, it's not proving problematic. 14 min: Perez finds some pace in his McLaren, topping the first sector. 14 min: Rosberg recovers from his early mistakes and goes third fastest, with a 1m27.363s. 14 min: That's a decent time from Perez, moving up to second fastest in 1m27.244s. 15 min: The medium tyre looked to be pretty durable this morning, so it is encouraging that drivers are still finding laptime as the runs continue. 16 min: Morning session star Bottas (well, he was 10th) is in the pits. He is 13th after the first batch of runs on the medium tyre. 17 min: Maldonado jumps his Williams team-mate and moves up to 13th with a 1m28.569s. 18 min: ...Because Rosberg's really taking the fight to the Red Bulls, on the medium tyre at least. 1m27.010s, and he is all of 0.001s quicker. 18 min: Still quite hazy out there around the circuit, but it is warm this afternoon with a 30 Celsius ambient - 39c on the asphalt. 19 min: Just four cars remain on the circuit at the moment. Rosberg is one of them, and he's complaining of understeer and going slowly. 19 min: Massa clocks his best of the session, currently sixth fastest. 19 min: And Rosberg brings his Mercedes into the pits and will want to strike a better balance. He's quick, but the Buddh circuit has caught him out a couple of times. 22 min: Something of a lull now as most outfits prepare to send drivers out on the soft compound. 24 min: Both Force Indias resume but they are back out on the medium tyre. 25 min: Vettel is back out now, and he has the soft tyre fitted. 25 min: Raikkonen is one of the first to kick off a run with the soft tyres. 27 min: Bottas and Vergne resume their running, and remain on the medium tyre. 27 min: Purple in the first sector for Raikkonen, so the soft rubber does look to be helping there... though he runs wide and that's blown it. 28 min: Personal bests for the medium-shod Sutil and di Resta, who are 14th and 16th respectively. 28 min: Two purple sectors for Vettel, this will be mighty. 28 min: Vettel goes quickest, unsurprisingly. It's a 1m25.722s. 29 min: Vergne, also on the medium tyres, has improved to 16th on a 1m28.720s. 29 min: Hulkenberg kicks off an attempt on soft rubber, while Raikkonen can't find a faster time after that mistake on his initial soft tyre attempt. 30 min: Webber, with soft tyres fitted to his Red Bull, joins in the fun. 31 min: It's a fast-slow-fast strategy for Vettel, who backs off after his session best effort but is now purple in sectors one and two. 32 min: However, Vettel aborts that flier and brings it into the pits. That was four laps on the soft tyre. 32 min: Raikkonen puts a lap together finally on softs, clocking 1m26.632s, now best-of-the-rest behind the Red Bull pair. 32 min: Rosberg is winding up for a flying lap, as Webber pops into second with his first soft-shod effort. 33 min: Perez is now rolling out with soft rubber on his McLaren. 33 min: Webber made a slight mistake on that flier, but still managed a 1m26.011s. 34 min: Rosberg's slightly down on Vettel in the first sector, but - much more ominously - would be a full second slower had the Red Bull completed its lap. 35 min: Rosberg finishes his lap, and it is only a 1m26.582s. That's not much of an improvement and he's third. 35 min: Hulkenberg not enjoying the balance of his Sauber there as it takes him off track. He's 11th at the moment after trying softs. 36 min: Perez grabs fifth fastest as he pumps in his soft tyre flyer. 36 min: Hamilton jumps up to seventh, on the medium tyre. He does a 1m27.115s. 38 min: Massa clocks 1m26.827s to take over that popular fifth slot. 39 min: Vettel's back out, and it's softs on the Red Bull once more. Let's see if he can complete the lap we think that car has in it. 41 min: Correction, Vettel isn't out just yet. Both Red Bulls remain in the garage. 41 min: More speed for Massa on his soft rubber, moving up to fourth fastest. Several drivers have found pace after the first lap on softs. 41 min: Rosberg brings his Mercedes in. He reports that the fronts are "just about OK". That was a six-lap stint. 42 min: That run from Rosberg is as long as we've seen on the softs. Before pitting on that lap, he was not far off his own best. 44 min: Adrian Sutil's showing well at the moment. He's switched to the soft tyre and has immediately jumped into the top 10 in ninth. 44 min: Button is told to wind up his McLaren for a single timed attempt. 45 min: Neither Toro Rosso has run the soft tyre yet, nor has Bottas' Williams. 45 min: Grosjean clocks 1m26.220s on soft rubber, just under half a second off Vettel's benchmark in third fastest. 48 min: Vergne now leaves the pits on soft tyres, while di Resta also switches and joins team-mate Sutil on track. 48 min: That flurry of action is almost over now, with many drivers back in the pits to ponder the results of the soft tyre attempts. 49 min: Vernge, looking wild, backs off his flying lap after running off track. He's winding up for another attempt. 50 min: Meanwhile, di Resta's run is much cleaner and he goes 13th on a 1m27.608s. 50 min: Webber emerges from the Red Bull garage. It looks like softs. 51 min: Mercedes' Rosberg does the same as Webber, and Hamilton now opts for a soft tyre run. 52 min: Hulkenberg is not happy with the soft tyres on his Sauber, reporting massive understeer and observing a lot of graining on the left front. 53 min: Hamilton goes fourth with his first effort on the soft tyre, on a 1m26.399s. 54 min: And Ricciardo, now with soft tyres fitted to his Toro Rosso, is up to 11th. 1m27.304s from the Aussie. 55 min: Now, Vettel is definitely on track. And he definitely has soft tyres fitted. 55 min: Gutierrez is now trying soft rubber but has been off track at the sweeping Turn 11. 56 min: Massa is heading out to test a long run on the medium compound. 57 min: Webber and Vettel look like they'll be putting the laps in on the soft tyre. Webber's on the fifth lap of this run. Vettel's has just started. 57 min: Hulkenberg pits his Sauber and the left front tyre looks angry, plenty of graining and even blistering there. 59 min: Webber pits at the end of his seventh lap on the soft tyre. Vettel's starting his sixth. 60 min: Soft rubber not looking like a great race option, with plenty degradation on show as the runs continue. 61 min: Comparing Webber, Vettel and Rosberg's sixth laps, Vettel's was a 1m33.7s, Rosberg's a 1m34.2s and Webber's a 1m34.7s. 61 min: Massa clocks a solid 1m32.658s lap on medium rubber, which at the moment looks like the favourable tyre for the majority of the distance. 62 min: Vettel and Webber are now swiftly back out on the medium tyre, as the long-running Rosberg begins his eighth lap on the soft. 64 min: Nine laps for Rosberg in this stint and now his times have tailed off, he's in the high 1m36s bracket now. 65 min: Button is now eight laps into his soft tyres, with pace now fading into the mid 1m33s. 65 min: By comparison, the first efforts from Vettel (1m30.892s) and Webber (1m31.55s) indicate the medium compound will be a far superior race tyre. 65 min: Alonso is pushing again on his softs, which have done eight laps, though he has been in and out of the pits in recent minutes. 66 min: Perez is told to run the distance on his medium compound to see how far that will go, as concern grows over the durability of the soft. 67 min: Drama for Maldonado. Bizarre incident with the front-right tyre, he's stopped at the pit entry and hasn't made it back. 68 min: Maldonado is now clambering from his Williams. Replays show the wheel nut making a break for it. 70 min: Hamilton and Rosberg are at the beginning of more soft tyre runs. Webber's outpacing Vettel on the mediums thus far. 71 min: Alonso clocking 1m34s on his softs now, though yellows are still out for that Maldonado drama. 71 min: Difficult to judge times after that double-yellow at Turn 18 but prior to the disruption Webber was in the mid 1m34s to Vettel's mid-1m35s. 72 min: While the Williams is craned away, there will be plenty of concern in that team after the outfit was heavily fined for the previous wheel loss. 73 min: Rosberg is on the medium tyre for this run, but Hamilton is five laps into the stint on the soft tyre. 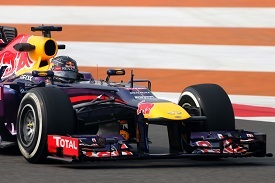 74 min: Impressive laps from Vettel and Webber, 1m31.392s and 1m31.431s respectively. They're approaching double-figures on the medium tyre. 74 min: Finally the track is clear again. 75 min: Alonso is still competing his softs, taking a decent beating after 15 laps, but he can still find 1m33.608s on the latest tour. 76 min: As a marker: Vettel's tyres are 15 laps old and he is on lap 10 of this run. Webber's tyres and run are both a lap older. 76 min: However, Massa is on a 1m31s pace with the clearly favourable medium compound. 76 min: By comparison, Rosberg's have done 12 laps in total. 76 min: Raikkonen reports that his "left front is completely done" as he bemoans the durability of soft compound. 78 min: Hamilton's last lap, his eighth of this run and 13th on the soft tyres, was two seconds slower than each of the Red Bulls. 79 min: Raikkonen is told to push his tyres until they are "unsafe" with Lotus keen to find the cliff from this fragile rubber. 79 min: Raikkonen is in the mid 1m33s at the moment, which is fairly typical of those on well-worn softs. 79 min: Meanwhile the McLaren pair are on a solid 1m31s pace on medium rubber. 80 min: Rosberg's losing several tenths a lap to the Red Bulls, who are metronomically lapping in the high-1m30s/low 1m31. 81 min: Raikkonen has not helped his melted left front with a lock-up at the final corner. He's still going around in 1m33s though. 83 min: Alonso is also persisting with the softs, with the Spaniard seeming to have found some stability, albeit slow in mid 1m33s. 84 min: Rosberg's not giving up on the mediums. His last two laps outpaced Webber, with a best of 1m30.824s. 84 min: By comparison, Vettel's just posted a 1m30.248s on his 15th lap of this run. 86 min: Both Red Bulls dip into the very high 1m29s now. 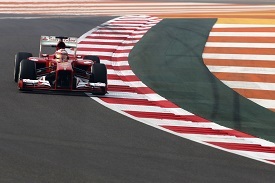 Vettel does two in a row, despite a lock-up at the penultimate corner. 87 min: Hamilton has finally shed those soft tyres, after a solid run, and his now onto the mediums. The Mercedes' look to be lacking about a second. 87 min: Bottas' session is over as Williams park his car to analyse the wheelnut issue that curtailed his team-mate's running. 88 min: Grosjean has a tidy 1m30.464s pace on his medium compound at the moment. 89 min: Raikkonen is still on his softs but it's not going well now, pace in 1m36s. He did want to try medium before the end. 89 min: That's the flag on second practice. 10:00 Rosberg ends the session with a better lap - 1m30.637s - but neither Mercedes managed a consistent run in that bracket. 10:01 The Red Bulls' runs ticket over to 20 laps and Vettel caps it off with another lap in the 1m29s. It's ominous. 10:02 Hulkenberg reports that his car is "mega" on the medium tyres. 10:02 While Massa runs to the flag with a very consistent 1m31s pace on his medium rubber, with 22 laps in his late stint. 10:03 So, the soft tyre runs inevitably stole the show, with Vettel a quarter of a second clear of Red Bull team-mate Mark Webber. 10:03 Grosjean ends an impressive session third fastest, and with good long-run pace that probably splits the Red Bulls and the Mercs. 10:04 Hamilton had the edge on Rosberg, while Alonso split the two Silver Arrows in fifth. Massa ends the session seventh in the second Ferrari. 10:05 Raikkonen, Perez and Button round out the top 10 in second practice in India. 10:05 Once again, though, Red Bull has the edge in all conditions. Join us tomorrow as the story of the Indian GP continues.